On Apr. 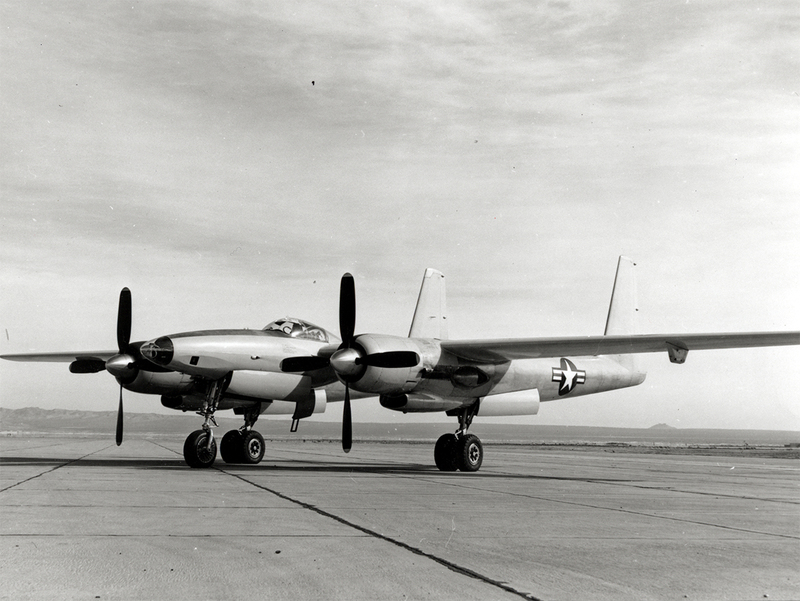 5, 1947, the second prototype of the Hughes XF-11 twin-boom aircraft made its first complete flight (takeoff and safe landing), piloted by Howard Hughes. Designed and built by Hughes Aircraft for the U.S. Army Air Forces (USAAF), the Hughes XF-11 was a prototype military reconnaissance aircraft. Noteworthy the first prototype of the aircraft, tail number 44-70155, driven by Hughes, crashed Jul. 7, 1946 while on its maiden flight from the Hughes Aircraft Co. factory airfield at Culver City, California. The accident happened because Hughes did not follow the testing program and communications protocol, and stayed airborne almost twice as long as planned. An hour into the flight (after onboard recording cameras had run out of film), a leak caused the right-hand propeller controls to lose their effectiveness and the rear propeller subsequently reversed its pitch, disrupting that engine’s thrust. This caused the aircraft to yaw hard to the right. Rather than feathering the propeller, Hughes performed improvised troubleshooting (including raising and lowering the gear) during which he flew away from his factory runway. Constantly losing altitude, he finally attempted to reach the golf course of the Los Angeles Country Club, but about 300 yards short of the course, the aircraft suddenly lost altitude and clipped three houses. The third house was destroyed by fire, and Hughes was nearly killed. The crash is dramatized in the 2004 movie The Aviator.